The name “brownies” first appeared in the 1896 Boston Cooking School Cookbook, where it describes molasses cakes baked in small tins. The origin of the Brownie is thought to be American and and is thought to derive its name from the brown color of the cookie. Folklore has its origin coming from a careless cook that forgot to put baking powder in the chocolate cake batter recipe. 1. 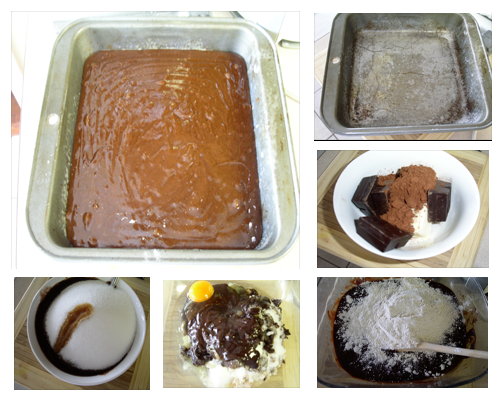 Preheat oven to 350F and coat an 8″ square baking pan with nonstick spray. Melt the chocolate, butter, cocoa and coffee in a bowl in the microwave for 30 sec. Stir until smooth. Stir in sugar, vanilla and salt. Add eggs one at a time, blending well after each addition. Fold in flour. Spread batter in prepared pan. This is the basic brownie, if you want to you can add nuts and bake for 30-40 min. 2. Cool completely before cutting. In this case we won’t bake the brownies just yet. We have to add the cream cheese mix first. Beat the cream cheese, sugar lemon juice mix until smooth. 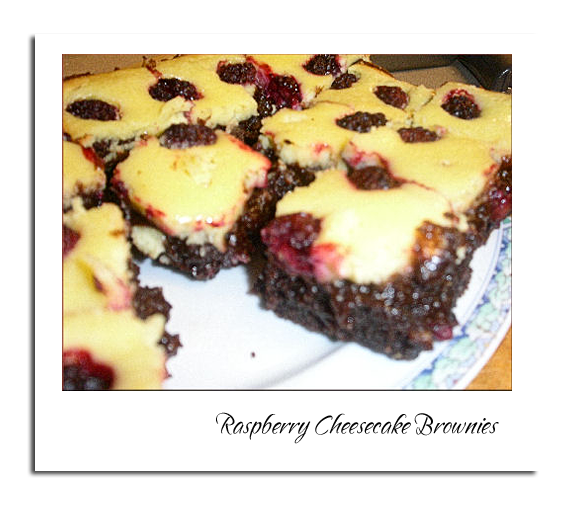 Blend in the egg, the spread cheesecake mixture over unbaked brownie batter. Top with the raspberries (if you like you can add different kind of fruit). Bake for 1 hour or until cheesecake is set and golden around edges. Cool brownies in pan cover and chill overnight. Dust with powder sugar. Preheat oven to 350F and coat an 8" square baking pan with nonstick spray. Melt the chocolate, butter, cocoa and coffee in a bowl in the microwave for 30 sec. Stir until smooth. Stir in sugar, vanilla and salt. Add eggs one at a time, blending well after each addition. Fold in flour. Spread batter in prepared pan. This is the basic brownie, if you want to you can add nuts and bake for 30-40 min. Cool completely before cutting. In this case we won't bake the brownies just yet. We have to add the cream cheese mix first. Beat the cream cheese, sugar lemon juice mix until smooth. 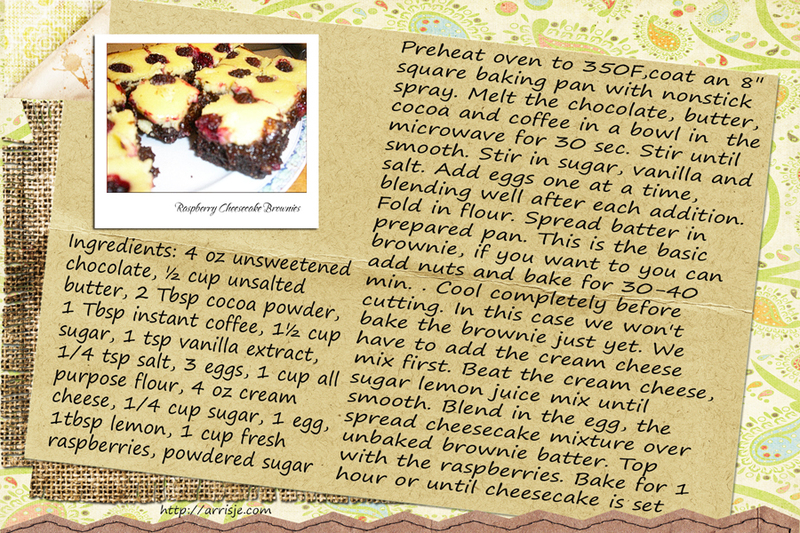 Blend in the egg, the spread cheesecake mixture over unbaked brownie batter. Top with the raspberries (if you like you can add different kind of fruit). Bake for 1 hour or until cheesecake is set and golden around edges. Cool brownies in pan cover and chill overnight. Dust with powder sugar.